If you promise to tell, I’ll let you in on the Coutts’ top secret plan…the galleries will have a new look to be revealed in June, so schedule your visit during the summer. And by then, a new elevator currently being installed will allow easier access to the museum’s three floors in the historic bank building. 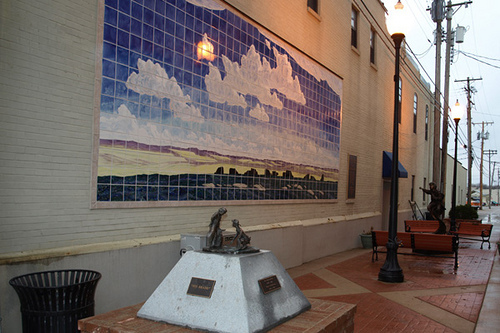 The warm days also will be the perfect time to view the gigantic, tile mosaic mural of the Flint Hills adorning the outside wall of a historic building in what’s called, appropriately, Sculpture Alley, right next to the Coutts. The 10x25-foot scene, two sculptures, and a painting make what once was a barren space between two buildings an inviting place to relax.Even the sidewalks here hold the unexpected. Walking down El Dorado’s Main Street, I found a beautiful sculpture of a little girl reading a book. On down the block, I looked up to see a hawk captured in flight. You’ll have fun spotting all 16 – count them, that’s 16 – pieces of art that line the streets, and be sure to check out the four private art galleries along the way. In the back room of The Circle Gallery is The Iron Horse Concert Hall, where artsy guitars line the walls. Tune in on a Saturday night to hear a Kansas musician or group perform folk, pop rock, blues, classical, jazz, or ragtime on the acoustic guitar, piano, banjo, fiddle, or hammered dulcimer. It’s no wonder El Dorado is known as The City of The Arts. What secret art can be found in your community?